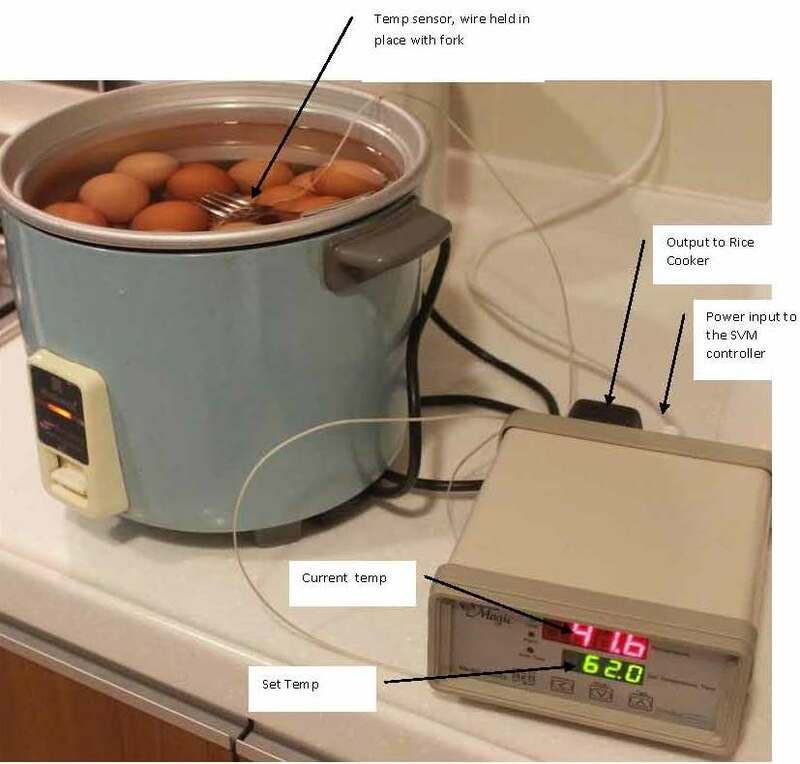 In a recent post, I have mentioned the use of the tap, pot and induction cooker method to maintain the constant temperature needed to make 'perfect' half-boiled eggs. This is a "Manual Sous Vide" method or sometimes called "Ghetto Sous Vide." Having experimented further, there are other ways of doing the 62C-45M eggs. The length of time (45m) remains, but these methods need less attention. You can "close and forget" - sort of. Eggs from a coffee-shop in Kota Bahru - this pic is sent by my brother. He loves the eggs there. I have not mentioned this tool yet but the Thermal Magic Pot is a great appliance to have in any home kitchen. After you heat up the pot on your induction cooker or stove, you thermal insulate it and it just keeps cooking. The temp will drop, but very slowly. There are many practical uses for this pot and if you cook regularly, you will find it useful. It saves "cooking attention time." You can make soups, stocks (i.e. Prawn Mee) and even braised dishes like Tau Yew Bak. It is somewhat similar to the slow cooker, except that it has no on-going heat input. It is also one way to keep the dish warm. Or cold i.e. drinks or desserts. As my thermal pot drops only 2°-3°C over a 45 min period, I boil the water to 66-68°C and then put the whole pot into the insulator. I "close (the pot) and forget" till 45 mins is up. In fact, I can even "forget" beyond that. As long as the temp does not go up, it just keeps the eggs warmed. The heat in the pot retains better if it is full. Fill up the water up to the brim of the pot. Find a way to put the eggs in the middle (avoid direct contact with bottom surface). Use a steam rack. Put the eggs in, heat up the pot to 66° (or 68), close the lid and then transfer it to the thermal insulator and close it's lid. That's it. The better ones (more expensive) retain heat better. I suppose some salesperson will wise up to this and demo it's use for soft boiled eggs. That said, there are other factors to consider. It is best that the egg is at room temp when the 45min count starts in the thermal insulator so that it gets cooked at 62-66°C during that period. If not, lengthen the time by 5 or 10 mins. Experiment and get this right and it will pay off if you already own a thermal magic pot. This method requires the least fuss. The results, though better than the conventional 7-8 mins way, is "less perfect" than SV methods, and these will be discussed below. The other method is to use a Sous Vide appliance. Many have said that this will be a popular way of cooking in the future: vacuum-sealed food cooked at a constant temp water bath. Set the temp and time and the food comes out exactly the same way each time. career change as an egg cooker. So, let me introduce Sous Vide Magic, a PID* temperature controller. This thing which looks like gadgets I used to see in labs when I was a Chemistry student. It can be had for about USD150. Bottom in green is the set temp, above is the actual. Pair it with a rice cooker and you will have a Sous Vide set up. Since the rice cooker is deep enough and not large, a water circulator is not necessary. What it does is to keep the temp constant at the one you set on the machine. It does this by regulating the power to the rice cooker (which needs to be the usual manual press button on-off, warm/cook type. Those with fuzzy logic and electronic switches will not work). There is less fluctuation in the temp. Set it to 62°C and it stays there. Of course you should consider buying this only if you have an interest in using Sous Vide cooking for steaks, fish and veg. There are some advantages to SV home-cooking and I hope to blog them along the way as I experiment with some local dishes. It's usefulness for 62-45 eggs is obvious and in fact eggs is about one of the easiest foods to SV as it comes already "vacuum-sealed." Google "Sous Vide" and you will find many helpful informative sites to guide you along the way if you are interested in it. This site has some great info. stove, consider using ice or other ways to keep the temp constant. The results are good, comparable to a proper Sous Vide set-up. The disadvantage is the attention it needs. You can still fine-tune your set up to minimise the attention needed. It is definitely not practical for longer cooking times, such as the 48-hours beef short ribs! If you love eggs and these results enough to bother, use it. I would. Especially if I am cooking for others. If you already own this pot, here is one more use for it. It is more convenient as it is fast to set up and needs no attention during the cooking time. From my experience thus far, though the results are not as 'stunning' as the regular SV methods, they are pretty good. I transfer to the insulator at 66°C and after 45 mins, it dropped to 62°C. As there is no heat being applied throughout and as the eggs were cooked at a temp range, I find it difficult to repeat the "perfect" results I get from the other methods. My hunch is that the inner core temp of the eggs may be lower than the water at any given time. With this method, you have to be satisfied with the results of cooking within a small temp range. See the photos. The results are pretty good, comparable with those done by coffee-shops that you frequent. Do experiment with yours, with different starting temps. If someone out there can find a way to use this pot and perfect the results, do let me know. Will I recommend this method? Definitely, especially if you already own this. If you are cooking a batch, this method is convenient. You will need a thermometer. It goes without saying that an automated Sous Vide set-up produces the best results as it keeps the temp constant at 62°C. Though you need to set it up (as I am familiar with IT, setting this up is a no-brainer), once it starts, you do not need to pay attention to it. It has its own timer (which kicks in once the set temp is reached). You should only buy it if you intend to dabble in Sous Vide cooking. You can purchase the Sous Vide Magic online here at Fresh Meals Solutions. If you can find another way of using home kitchen tools to make these eggs, do let me know. The readers here will be grateful. These are of course a different kind of soft-boiled eggs: the Onsen Tamago (hot springs egg) way. You can cook the usual type using the plastic drip and other 6-8 min ways, but the results are not the same though you, like millions round the world, may have been enjoying eggs this way. All three methods are also good for making large batches of soft-boiled eggs. Some coffee-shops do it this way. As they do it daily, they do not need a thermometer and have got the system all worked out. For my family (which includes me! ), I cook a batch, chill it in some ice (for safer food hygiene) and fridge it immediately. For the next 2-3 days, we will take them out, warmed it up in hot for about 5 minutes and enjoy a glorious breakfast. I mentioned in my earlier post about my preference for CP Fresh Chilled Eggs. If you are making a batch for the week, spending more time to get it perfected makes sense. The chilled cooked eggs can also be used for salads and other dishes. You can even sunny side them. For dinner...Served chilled, sprinkled with some Jap herbs and spices, silken tofu at the bottom. Will definitely serve it, if not this Wed, in future sessions! Just ordered the magic machine, so awaiting your sous vide experiments! Can u advise the time for cooking eggs via sous vide method at 62C? I experimented with making soft-boiled eggs and have perfected it, it isn't as complicated and elaborated as your set-up. In fact, the ones sold at the traditional coffee shops/ kopitiam uses nothing fanciful! Serve with pepper & soya sauce. If u eat the eggs done at places like Yakun (you need to be in Singapore), you will notice that the soft-boiled eggs they do are different. The white holds it shape and the yolk is creamy. While you can do it through the normal 5-7 minutes way (which I use a lot in the past), the result is different. Google onsen tamago to read about the Jap way of doing eggs. I love soft boiled eggs done the Ya Kun way and can never get it done no matter which method I use. Seems like sous vide is the way to go. When you say you warm it in hot for 5 minutes after chilling them, do you mean to put them in boiling water for 5 minutes, covered? Wouldn't that cook the eggs further? Hi FC, I would also like to know your comment to LC. I believe you meant to warm the chilled eggs in warm water for 5mins. In your post when you said regular eggs would you elaborate further i.e. 55gm/60gm eggs? Nowadays the supermarket packed eggs are labelled with the weight of the eggs. LC - To reheat the already cooked eggs, 5 minutes in hot water in a covered bowl should warm up the eggs. Chao - as for the weight of the eggs (small, large or medium), I treat them all the same re cooking time.